Although we’re experiencing a minor cold snap out here in Hawaii, it seems like the rest of the country is finally starting to warm up. So it’s a good bet that many of you are starting the transition from hearty soups and stews to lighter spring and summer fare. 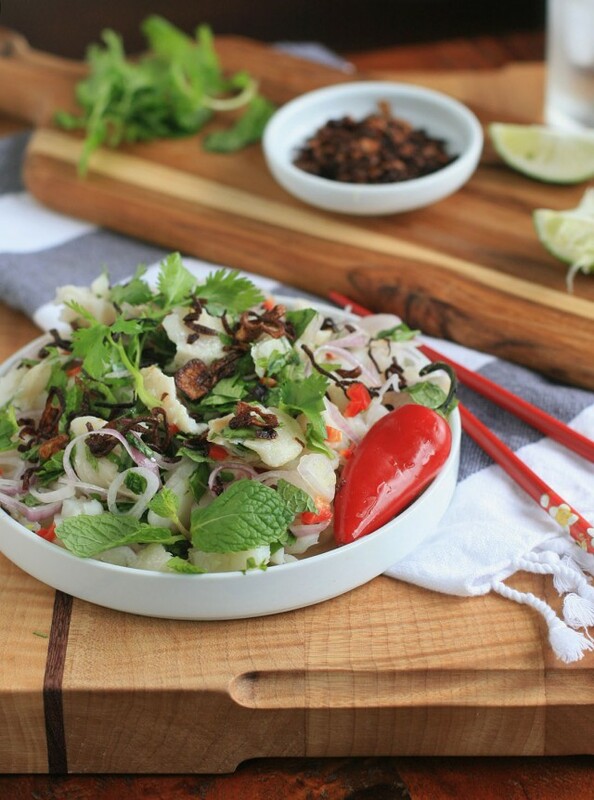 Some of my favorite warm weather dishes are Hawaiian poke, Peruvian ceviche or Tahitian poisson cru, but if the idea of eating raw fish gives you the heebie jeebies, then you might want to try this light and refreshing Burmese fish salad instead. 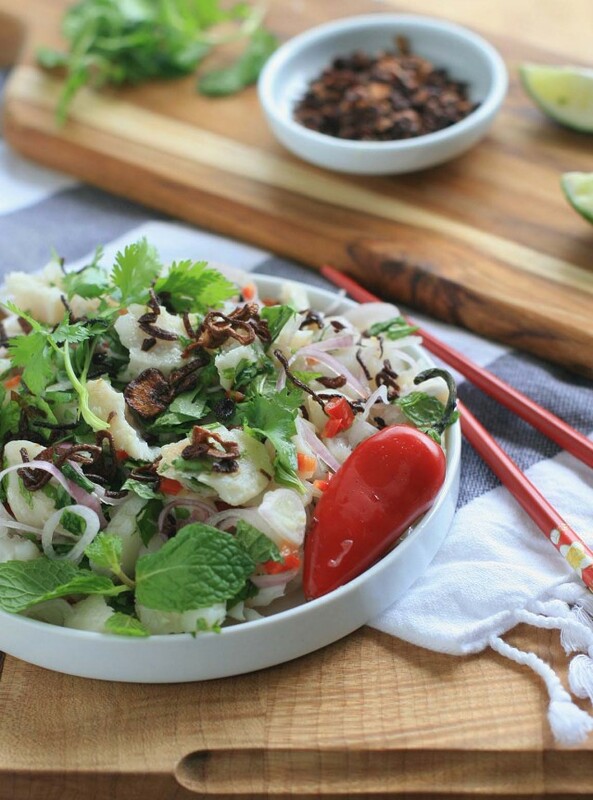 Your favorite filet of fish is poached in lemongrass-infused water (or if you’ve got some leftover fish to use up, feel free to use that instead), flaked, and then combined with plenty of shallots, chile pepper, and herbs. The mixture is then tossed in a shallot and lime juice dressing. 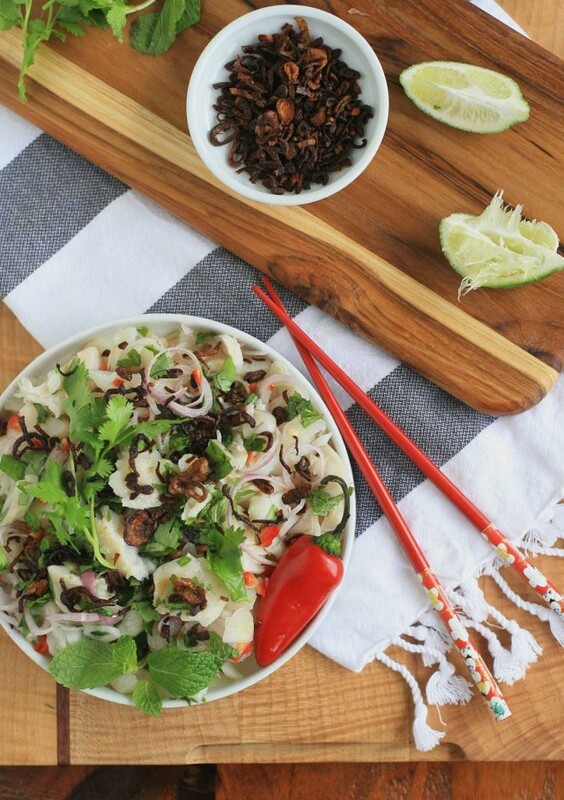 It’s refreshing, lightly spicy and filling without being heavy. Serve it alongside another salad or two (like perhaps this spinach one and/or this grated carrot one?) for a light lunch or even wrap it up in lettuce leaves for a fun appetizer or entree. Because the dressing contains citrus juice, which will continue to “cook” the fish, this salad is best the day it’s made. Combine the water and lemongrass in a large saucepan and bring to boil. Add the salt and the fish and bring the water back to a boil. Reduce heat, cover the saucepan and cook the fish, keeping the water at a strong simmer, until the fish is just cooked through. Remove the fish to a plate to let cool. Discard the poaching water or reserve it for another use. When the fish is cool enough to handle, break it into small chunks or flakes, depending on your preference. Add the shallots, lime juice, fish sauce, shallot oil, fried shallots, salt, chile pepper, and herbs and toss. Taste and adjust salt, if necessary. Serve at room temperature or slightly chilled.